Add this Facebook frame and twibbon to your profile pictures. #ShowYourRare – show your support for the rare disease community by painting your face and/ or holding up this social media board in your selfie on social media. When? Throughout the entire month of Feb and in the lead up to Rare Disease Day on 28 February. More info. 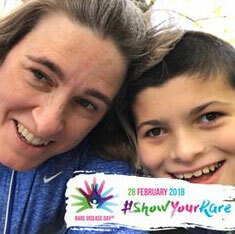 Remember to include the hashtags #ShowYourRare and #RareDiseaseDay in your posts!